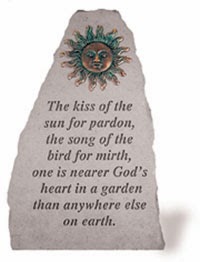 The fourth stanza of this poem is very familiar, since it appears on many garden signs. I found this one on Ebay. I'm not sure, though, that I had ever read the rest of the poem. I found out that Dorothy Frances Gurney wrote this originally in a guest book, after she had enjoyed a stay with a friend who had a beautiful garden. In fact, it was this garden, Penshurst Place in Kent. Having a garden like that requires rather a large staff! This may seem a bit of an inappropriate poem for this time of year, but here in Haiti where I live it is still beautiful weather, though a bit chilly right now, at 75 degrees. It is supposed to get up to 93 later today. (Do I sound smug? Sorry. I just can't help it sometimes.) I don't have to go back to work until Monday, so I'm savoring these last few days and a little more ease for the soul. The roundup is here today. Enjoy the first Poetry Friday of the year! "One is nearer God's heart in a garden," beautiful line. Thanks for sharing this poem today. ....being a gardener myself. 93 degrees today, Ruth??? I have warm weather envy! Go ahead and be smug. We're having FUN in our sub-zero temperatures...NOT!!! Here's hoping 2014 gets us a little closer to a world where "the hawk might nest with the wren." 93 degrees???? Oh, my gosh. Thank you for sharing this beautiful poem. Enjoy your garden days, Ruth! What a powerful last stanza. It turns the whole poem around from being about nature to far more. This would be a good poem for Passion Week. Thanks for sharing this.